Kaziranga National Park is home for Indian One Horned Rhinoceros and is situated in the state of Assam, in North Eastern part of India. Kaziranga National Park is a UNESCO World Heritage Site. Kaziranga National Park was declared as a Park in 1905. Many wild animals and endangered species in India which includes endangered animals and endangered birds can be seen at Kaziranga wildlife park. Kaziranga National Park is home to Bengal Tigers also and is part of Project tiger. Kaziranga National Park has the maximum density of tigers among declared tiger reserves in the world. The Fauna, which includes some of the endangered species in India are Elephants, tigers, barking deer, barasingha or swamp deer, sambar, panthers, Bison,wild water buffalo, leopard cats, otters, golden langurs, capped langur, etc. You can see many endangered species in India, some of which can be seen here in Kaziranga wildlife Sanctuary. Many species of birds, especially Avifaunal which is an endangered species in India, are conserved here in the National Park of Kaziranga, under Birdlife International’s initiative. Many species of reptiles can be found here in Kaziranga wild life Sanctuary. Elephant rides are available in the Wildlife Park of Kaziranga from Mihimukh 3 kilometers away from Kohora. Jeep Safari is also allowed in the Kaziranga National Park. You can take your own Jeep if you want. 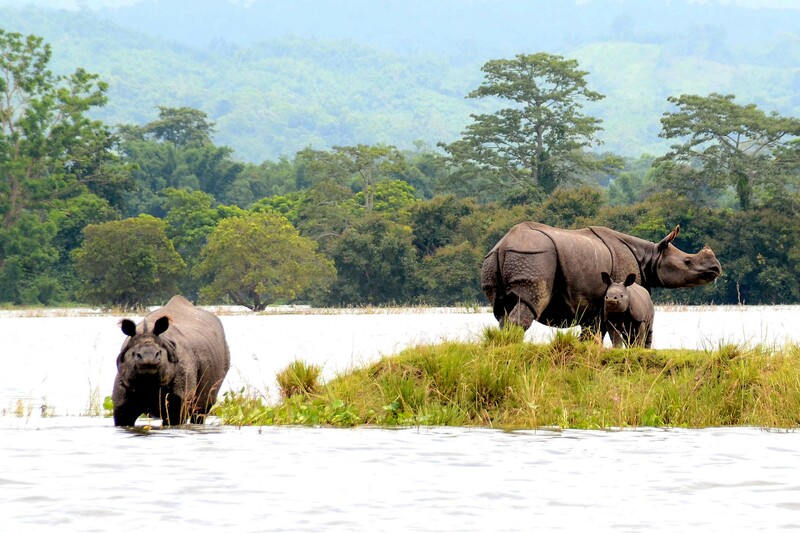 Pobitora wildlife sanctuary is a nearby sanctuary in Assam having the highest density of greater one-horned rhinoceros or The Indian rhinoceros in the world. Manas National Park or Manas Wildlife Sanctuary is a nearby UNESCO Natural World Heritage site in Assam bordering Bhutan, which also has One Horned Rhinos among other wild animals. How Do I Go to Kaziranga Wildlife Sanctuary? The nearest airport to Kaziranga Wildlife Sanctuary is at Jorhat around 100 kilometers away which is also called known as Rowriah Airport. Only very few flights are available to this airport. Hence Guwahati airport at 215 kilometers away, is the major nearby airport . Furkating Junction is the nearest railway station at around 70 kilometers distance with station code FKG for online booking of train tickets at the Indian online ticketing system of Indian Railway and Catering and Tourism Corporation Ltd’s website, irctc.co.in. The main gate of Kaziranga National Park on the place called Kohora, on National Highway NH 37. What is the Ideal Time to Visit the Kaziranga National Park? November to April is the ideal time to visit Kaziranga National Park. Is Accommodation Available Near to Kaziranga National Park? Baguri and Kohora on NH 37 offers different varieties of accommodation facilities (forest bungalows, hotels, lodges, etc) to tourists. It is safer to book accommodation earlier as there is good demand there on certain days.